Buying your first pair of Muay Thai shorts can be an exciting moment. Not only are Muay Thai shorts a traditional part of the sport, they’re actually also useful because they give you the ability to move freely and kick higher without any type of restraint. I know many different styles can look and even feel goofy at first, however Muay Thai shorts are one of those things that once you try it you won’t be able to train without them. The main objective of this guide is to find the best Muay Thai shorts for you as an individual. Every time I start writing about another product or training guide I get excited because I know that it could potentially help a younger version of me. 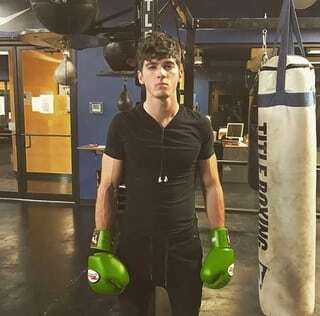 When I first started Muay Thai I was completely clueless, I had no idea what gloves to buy, I had no idea where to train, I knew absolutely nothing. I know how it can feel to be completely clueless and want someone to help guide you. If you’re clueless on other equipment to buy, visit our ultimate Muay Thai buyer’s guide for all gear and equipment. I love Muay Thai and it’s an honor to share my passion with people who want to progress in this sport. Finding the best Muay Thai shorts is a small part of your Muay Thai journey, however it will get you on the right track to start. The first pair of Muay Thai shorts I purchased were about 3 sizes too small, which is why I take this buying guide so seriously. Walking into my Muay Thai gym with a big smile on my face only to see my Kru laughing was quite embarrassing for me. Luckily, I suffered through those buying failures so that you don’t have to (and don’t worry, my Kru was just having fun). I wore those shorts that were 3 sizes too small for months until I could afford another pair. Believe it or not, I still own those shorts today and sometimes wear them just to remember the good ol’ days. If you’re on the western side of the world like I am then this size chart will look awfully confusing at first. For example, I usually wear a size Small/Medium in shorts (I’m 6’0 tall, however only 160 pounds), however I wear a size Large/XL in Muay Thai shorts. I know that some of you will be nervous to order a size 5XL for something like a 38 waist, however this is common because Thai people are naturally smaller than their western counterparts. I personally recommend sizing up, if you’re a 30 waist like I am I would order a size XL on the chart. This will also help with the length of the shorts, it’s always better to order bigger because you can always roll the waist up for a tighter fit, you can’t add material to your shorts to make them longer or wider however. Please note that brands have different size charts, always verify with their sizing chart before making a purchase. Once you find your perfect fit, you’re one step closer to finding the best Muay Thai shorts. There are two types of material Muay Thai shorts can be made out of: satin and nylon. I know it sounds silly but the material you buy can have a direct effect on your training sessions. No one wants uncomfortable shorts, I’ve made the mistake before training in cotton shorts (yikes). I think you can’t go wrong with either satin or nylon, however let’s talk about the differences between the two. Satin is commonly used in higher quality Muay Thai shorts. This is because they are light and comfortable, not to mention they are much more durable than nylon. Durability is important because chances are your shorts will go through many wars in the gym. You don’t want to purchase a pair of shorts that will rip after only a few uses. Satin is my go-to choice for Muay Thai shorts because they are much more comfortable to wear and kick in. Nylon is a lower quality material, however in certain types of shorts nylon can be the better alternative. Usually nylon shorts are thicker and the great think about quality nylon is that it dries up ridiculously fast. Nylon is a material I sometimes get because it’s much cheaper than satin and I also use them as lounge shorts on occasion. However I always would choose the comfort of satin materials over nylon. I believe both satin and nylon can give you quality Muay Thai shorts, however if you’re looking for the best Muay Thai shorts you should go with satin or a high quality fabric. 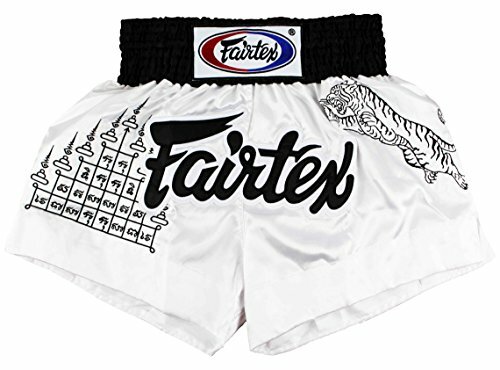 Fairtex is one of the most recognized brand in all of combat sports, their Muay Thai shorts live up to their high quality name. I originally purchased a few pairs of Fairtex shorts because I liked the designs on them, however I grew to love how they felt on my body. Not only are they comfortable and allow you to move freely, they’re also made of high quality material. The reason I know they’re high quality is because they’ve lasted me hundreds of uses and still feel the same as they did when I first bought them. These shorts have over 30 different designs to choose from, you could literally wear a different pair for every day of the month. These shorts are high quality, however be careful with sizing! Always reach the size chart and see what other people said online about the fit of the specific shorts you plan on buying. The Lumpinee Muay Thai shorts are designed and cut to suit contact sports including Muay Thai and Kickboxing. The design on the front of the shorts is in Thai language and actually says ‘Muay Thai’. Lumpinee is actually the original brand from the famous Lumpinee stadium in Thailand. 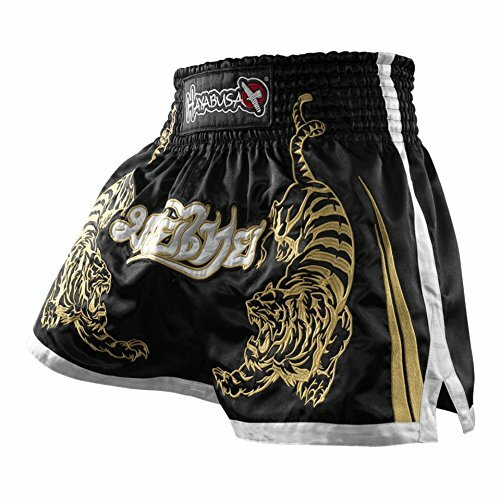 These Thai Boxing Shorts are 100% polyester satin, using the highest quality embroidery techniques and come from the epicenter of Muay Thai fighting in Thailand. They feature an extra wide cut in the leg area so as to allow the very most freedom of movement when kicking, performing knee strikes, and defensively checking kicks. They are ideal for both training and competition. 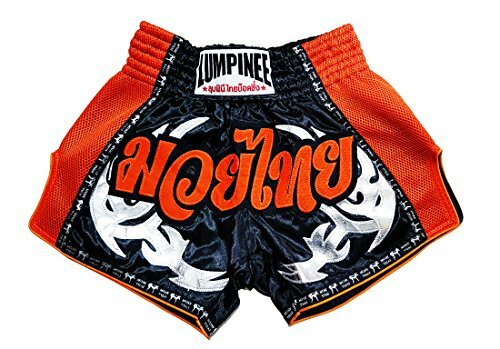 Lumpinee brand is a common sight at many Thailand training camps, gyms, and stadiums around the world. You will find them worn by both the best, seasoned Muay Thai Fighters as well as new students just starting. The only qualm I have about these shorts is that it’s difficult to find the perfect fit, but once you find the right size these shorts are amazing. Top King Muay Thai shorts have absolutely amazing reviews, however you must be careful while sizing. Muay Thai shorts traditionally run very small as we’ve talked about earlier, so size your shorts with that in mind. The shorts themselves are great quality and have amazing designs. Top King is a staple in Muay Thai and have been a trusted brand for many years. I personally don’t own a pair of these shorts but many people in my gym wear them every single day. These shorts are used in many professional Muay Thai fights because of their high quality design and comfort. Not only do they have over 20 design combinations to choose from, but they’ll also make you look like a proper Nak Muay (Thai fighter). 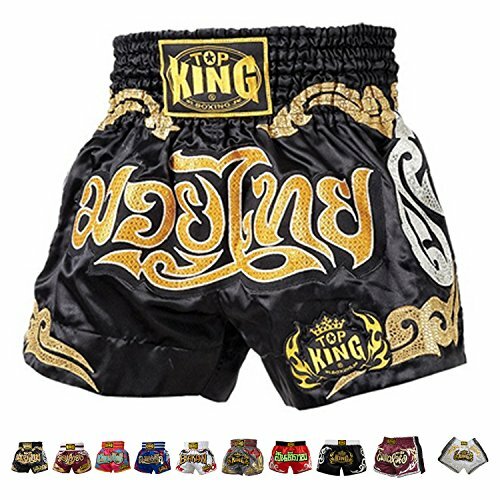 I’m going to be purchasing a few pair of Thai shorts soon and Top King is at the top of my list. Everyone who knows me knows that I’m a huge Twins Special fanatic. I love their brand for all types of Muay Thai gear, the shorts aren’t an exception. They come in over 15 different styles and designs that are sure to turn heads. I personally love the ‘red bull’ design, so naturally I bought 2 pairs. I believe Twins has the most unique style and design on this list. They incorporate many western designs with their products while still staying with traditional Muay Thai styles. I love the various camo designs as well (don’t judge me). If you love camo then I would highly recommend checking out the rest of the styles and designs Twins Special Muay Thai shorts have to offer. The only difficulty I ever have with Twins is the sizing chart can be a bit confusing at first. 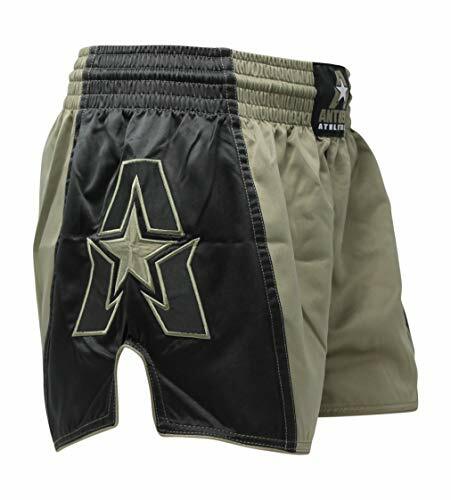 The Anthem Athletics Muay Thai shorts have a special shape and design that isn’t traditional to Muay Thai, however these shorts are great for Muay Thai training. With their stellar online reviews and great look, it’s hard to fight the urge to buy one of these awesome designs. I usually don’t sway away from traditional Muay Thai gear, however I personally own and love these shorts and their special cut. The thing I love most is that with their unique design they allow me to kick high and have great range and flexibility, while still being long enough where I feel comfortable in public with Muay Thai shorts on (which is rare). Another great thing about Anthem is that they come in Americanized sizes, although this might not be a good thing if you live in Thailand and already have your traditional Muay Thai short size. I find these shorts to be a good pair of shorts for hybrid training (MMA, Kickboxing, Karate). These premium Muay Thai shorts are equipped with elastic waistband and lightweight fabric, providing the perfect and most comfortable fit every time. Train and compete with unrestricted mobility and a bold authentic embroidered design. Hayabusa is seen mostly as an ‘MMA’ brand, however they did something right when making these shorts. I love how they kept a traditional Muay Thai design while using high quality materials (that many believe are better than Fairtex and Twins). The reviews online are stellar, the only downside is the price-point which is expensive. However if these shorts are as good as other Hayabusa products then the shorts are well worth the price. 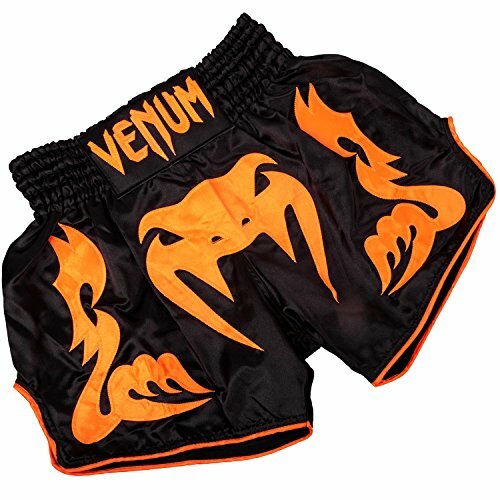 Venum’s Bangkok Inferno Muay Thai Shorts are exquisitely manufactured in Thailand, the original homeland of Muay Thai. They feature side slots that allow for a wide range of movement without restriction, and their traditional elastic waistband keeps them well positioned around your waist with every powerful strike you make. These Venum Muay Thai shorts have a great design, enhanced with colorful, hand-stitched embroidery. Insist on quality, intricate design, and comfort by getting your very own pair of these eye-catching Muay Thai shorts! I usually tend to stay away from Venum products (such as gloves), however these shorts are top of the line and I personally recommend grabbing a few pairs. When it comes to the best Muay Thai shorts, it really depends on your unique style and the look you want to portray. My first pair of shorts were very colorful and even a bit girly, however I liked them and that’s all that mattered. Whenever you’re buying Muay Thai shorts or Muay Thai gear for that matter, always choose the gear you like the most and not something you think that others will like. Muay Thai is a way to express yourself, and expressing yourself through the gear and equipment you wear should be something you are happy about.